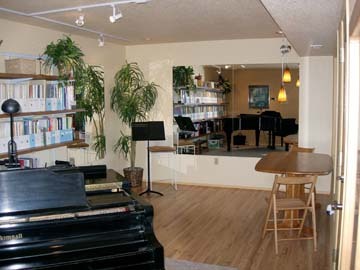 My Everett studio features a 250 square foot classroom with a grand piano, excellent acoustics, modern lighting, large full length practice mirrors, a street level entrance, and an adjacent kitchenette and bathroom. Exit 189, Everett Mall Way. Stay Right and turn Right on 19th Ave. Continue straight to second light. Turn Left onto 100th. Go one mile to blinking red light. Turn Right onto 35th Ave. Turn Left onto 104th Pl SE. Follow curving road to the right to the intersection of 40th Ave. SE. Turn Left and find 10315 part way down the hill on the Right (first cul-de-sac). Exit 189, Everett Mall Way - Turn Right onto Everett Mall Way. Turn Right again at first intersection onto 19th Ave. Continue straight to second light. Turn Left onto 100th. Go one mile to blinking red light. Turn Right onto 35th Ave. Turn Left onto 104th Pl SE. Follow curving road to the right to the intersection of 40th Ave. SE. Turn Left and find 10315 part way down the hill on the Right (first cul-de-sac). Hoey practices daily, averaging an hour and a half each day. “It’s a way to relax,” he says. “I work on a variety of pieces and techniques, so it doesn’t get boring.” He’s even learning to sight-read music, a necessary skill for those learning the classical pieces he prefers. Beverly Gilyeart, Hoey’s teacher, is a Seattle-based violin instructor. She hosts informal musical evenings for her adult students. Students can play a recital piece, enjoy a glass of wine and socialize with other adult learners in a supportive environment. Spouses are encouraged to attend.